The 6DR7 High-Mu Triode, Low-Mu Triode is used as combined vertical-deflection oscillator and vertical-deflection amplifier. The triodes also works well for AM/FM and general purpose oscillator circuits and for push-pull cathode-drive RF amplifiers. Excellent for antique radio or television restoration projects or to set up a private vacuum tube museum. 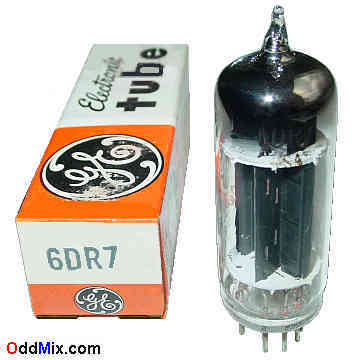 It is a tested ORIGINAL GE tube from the "good old times". Only one available.